Listed below are the top five shirts released for this season. These five shirts have been rated by myself purely based on aesthetic quality. All biases have been cast aside. All of the shirts listed below are shirts that I would happily wear as a Chelsea fan. I will try my best to justify the reasons to why I have rated them so highly. We start this list with Lecce. What stands out with this shirt other than the very striking design on the front of the shirt is who this shirt is being manufactured by. The manufacturer is "M908" who I suspect that you wont have ever heard of. The primary reason for this is because they are a brand new manufacturer to the game for this season. Also they are the clubs own manufacturer. So similar to the Maccabi Tel Aviv shirt that own, the club are going to make the shirts themselves and any proceeds are going to go directly into the club itself. The "908" part of the name is referring to the year of 1908 in which the club was formed. I quite like it when teams decide to follow a different path when it comes their football shirts and designing and making their own is well and truly going down a different path. With regards to the design of the shirt I can only assume that it is meant to be a wall or brickwork of some sorts. It certainly is an eye catching choice regardless. I think there is a version of the shirt available with sponsors but I don't believe it is an option for the fans, just for when the players are actually on the pitch which is a slight disappointment. 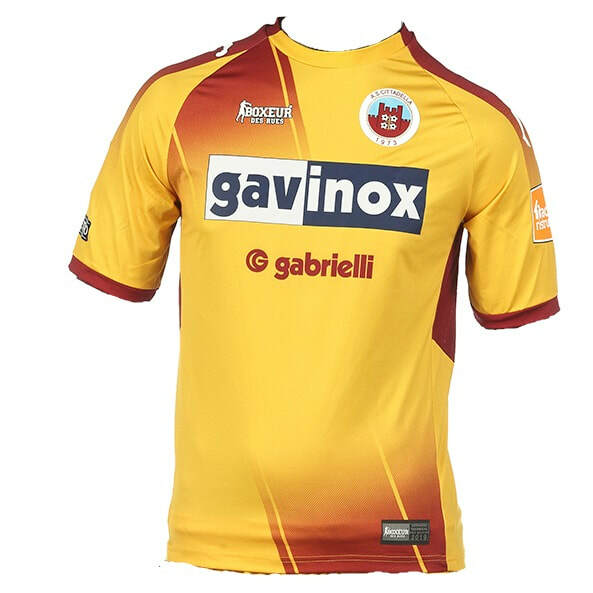 In fourth place we find a Cittadella shirt. This shirt is interestingly manufactured by Boxeur who a typically famous for boxing gear and clothing. I have tried looking online for more information about their football foray but I can't really find anything useful. As for the design of the shirt I do like this different approach on a diagonal sash. Instead of it running directly across the front it fades away to make room for the sponsor on the front. Any shirt that is conscientious about how it looks with and without sponsors is a smart shirt in my opinion. The colours that have been used work well together. The yellow and the brown/red fade into one another very well and compliment the overall look of the shirt. When it comes to being able to purchase this shirt I don't suspect that it will be particularly easy to do so. Unless I am able to buy it directly from the website I might find myself having to travel all the way to Italy to pick up the shirt so I can add it into my collection. Think I might pass on this one. 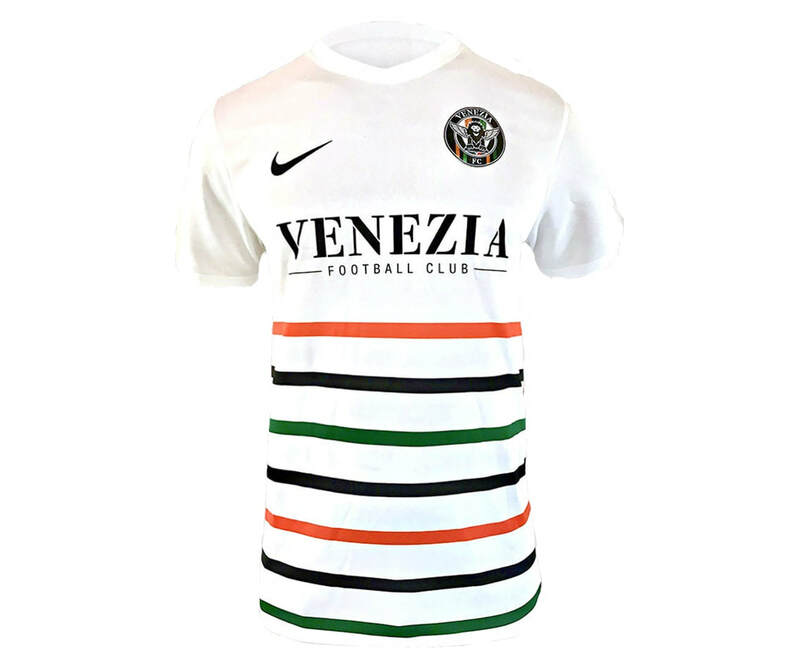 Every season Venezia always seem to release amazingly designed shirts. This season I believe that the away shirt is their best shirt that they will be wearing. The standout feature of course is the trifecta of horizontal lines. The use of three different colours isn't all that common when it comes to football shirts which is a shame in my opinion as this looks really smart. The club colours of black, orange and green work really well together, especially against the backdrop of the white body. The shirt doesn't have a sponsor on the front but it does have the clubs name across the front which looks well presented. Also I think the club logo is one of the best around and will look good on any football shirt design. I would be very pleased to own this shirt and add to my collection as there seems to be a sort of magic surrounding this club. This shirt has everything required to make a memorable and well sort of after shirt. Firstly having the shirt being manufactured by Macron is a great start. They make amazing shirts and I am not surprised to see that they have design this shirt. Secondly the colour scheme that has been used is one of the best combinations that can be used. Any shirt that utilises gold somehow always stands out and this shirt is covered in it. When this is paired with black you have a recipe for guaranteed success. Thirdly I am always a huge fan of shirts that feature a different club logo to what is usually used. The logo for this shirt is taken from a section of the standard logo. They have utilised just the mastiffs to leave a powerful but simple logo to celebrate the 115th year of the clubs existence. This is shown through the subtle transfer of the "115" behind the logo. 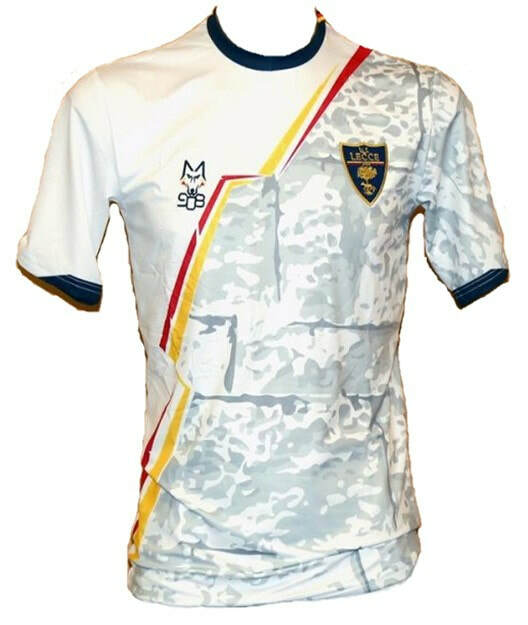 I already own a Hellas Verona shirt and I am deciding whether or not if I should should buy this one to replace it as I really do love this design. Just pipping the Hellas Verona shirt to first place is this third shirt that will be worn by Benevento this season. The reason why this one stood out slightly more than the Hellas one is down to the design used for this shirt. If there is one design that I like above all others it is the one used in this shirt. The free flowing design that ripples across the front of shirt always looks great from the point of view of a football shirt collector. Also the colour scheme used for this shirt is somewhat unique which adds to the allure of this shirt. 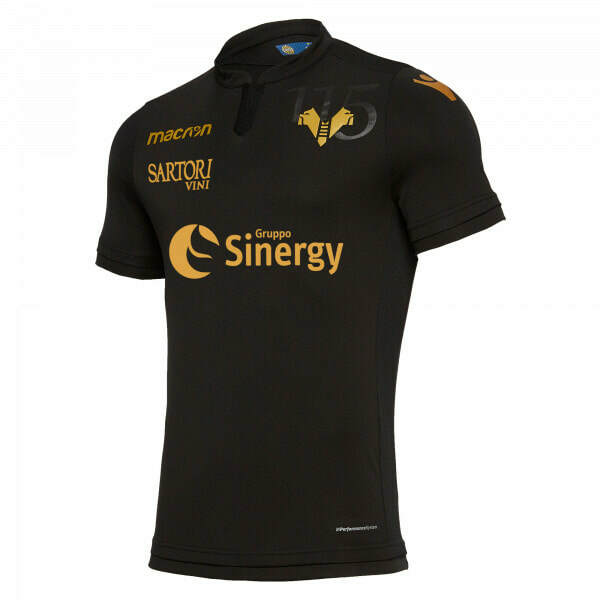 The sponsors are positioned suitably enough for this shirt and don't distract too much attention away from the overall design. 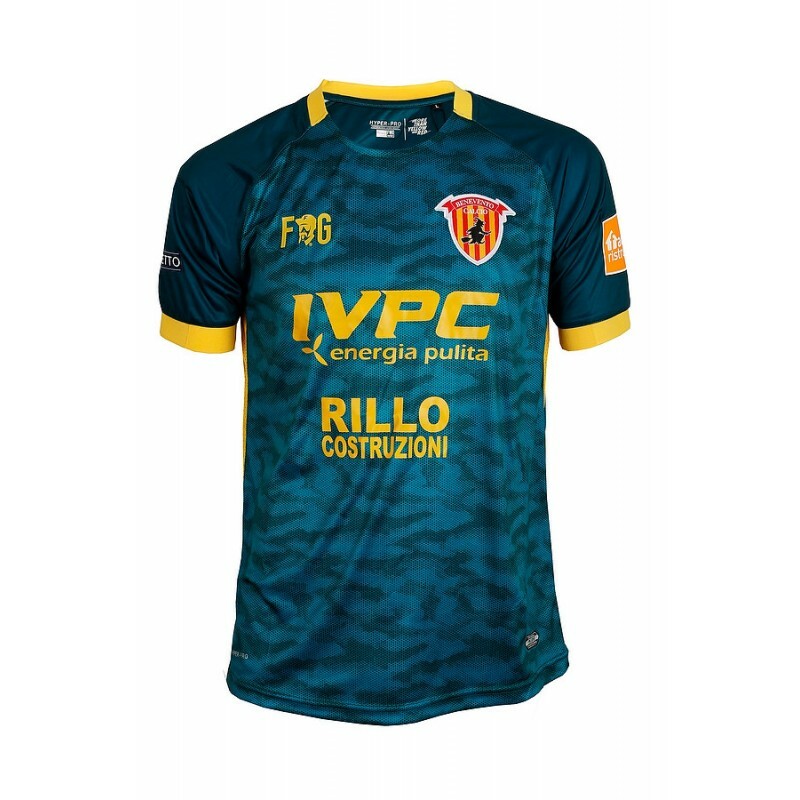 The shirt is manufactured by FG Sport a company that I have yet to own a shirt from but have seen been used quite a few times for teams in Italy. I have no doubts in the quality of the shirt. I would love to own this shirt and it is very tempting to pick up this shirt from their online store. Maybe once the season comes to a close I will grab it as an end of season present.